What era do you want to see next? Discussion in 'Benioff & Weiss's Film Series' started by Kylo Solo, Feb 13, 2018. The Old Republic era should be next. "The Prime Jedi" is in perfect balance. However, she/he has two apprentices. One apprentice embraces the dark side while the other embraces the light side, birthing the Jedi-Sith conflict. I'd like to see before the movies and canon comics and novels. Maybe something from the creation of the Jedi to the creation of the Sith empire to the creation of the Rule of Two. Explain or demonstrate Jedi folklore, overpowered Sith Lords, etc. I want to see an army of Jedi battling an army of Sith. maybe from a sith point of view??? Old Republic era. I'm already disappointed that they've never once released a movie about it before, I'll riot if it absolutely never happens. The discovery of the Force, the first Jedi, the first temple, the first duality, when first books were written. I'd like to see a trilogy set a thousand years into the future, of course focused on the Skywalkers. It would change the way we see the original characters and SW altogether. Right now, watching SW feels like watching something that is happening right now (despite the "a long time ago"), but if the story jumped a thousand years forward, the original and sequel trilogies would truly feel like they took place in the past. The original/sequel characters would no longer be the focus of the viewers, they would become "the ancestors". It would be both odd and awesome. Something that takes place far away enough from the original movies so they do feel they have to borrow plot elements from better movies. Something distant enough that they have to get creative. Something new enough that will excite. I do not care if it is two days after Phantom Menace or billion years before or after a New Hope. If I had to pick, I would rather it be a future movie so you have absolutely no idea of what happens next. Any era will do for me, I love it all. But it would be (will be with RJ's trilogy) cool to see entierly new sides and aspects of the SW Galaxy, although I'd certainly be down for exploring even familiar conflicts and environments from different characters/cultures/social stratas' point of view. I love how Rogue One and Solo have informed the core films with added context and flavor for familiar things, and I'd love to see a sort of sidequel series filling out the foundations of the Skywalker Saga and/or exploring various peripheral facets of the stories we've had thus far. That said, I'd also love diving into the foundations of the Jedi order and the Jedi-Sith wars and the Old Republic at it's infacy etc. etc. 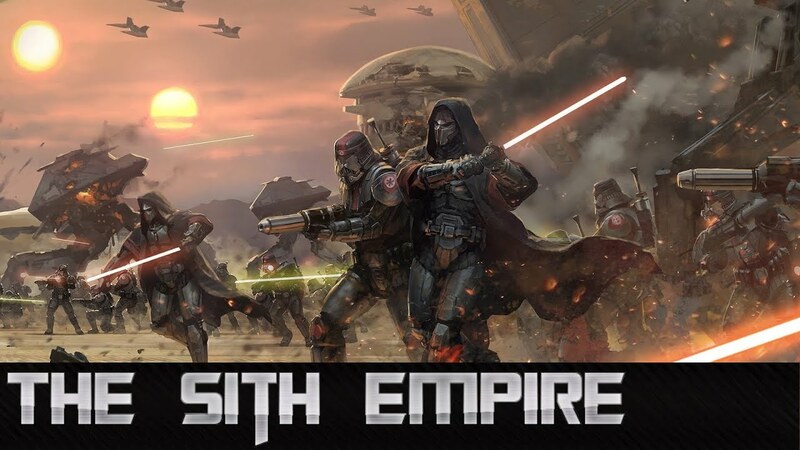 Seeing the art for the Sith Empire, I must admit - it would be great to see something like that on screen. Either the early years of the Empire or the Old Republic - years before the events of "The Phantom Menace". The Old Republic. Something that pre-dates Skywalkers and Solos by 1000's of years. Doesn't have to be a Revan or KotOR/SWTOR story, just something involving a much earlier Republic or even the Dawn of the Jedi. If its not Old Republic you will hear thousands fo fans cry out in terror... remaining optimistic, any era will do, just give us a great show. that said.. the thought of getting an Old Republic TV show or movie trilogy showing a young guy/girl thrust into the Sith Academy on Korriban and following their story makes me dribble incessantly. Following a young padawan through the Jedi academy trying to pass the Jedi trials and build their own light saber etc also makes me dribble.. but not as much lol. I think it would be really great to have old republic (or whatever one wishes to call the time period in Disney Canon) for a few reasons: a. It's a wholly different time period making it easier for Lucasfilm to move on from the Skywalker saga, b. It would fill in a past that has only been hinted at in CW and Rebels with much needed richness, c. It would enable stories in a much less dispoiled galaxy (I'm lookin at you Ilum), c. It could begin the process of solidifying the future of Star Wars for the long-term by canonizing the best elements of old republic lore while at the same time stripping out the really fan-fictiony cringe that occasionally pops up in Legends continuity's darker corners, and d. It would give us an earlier, more primitive view of the force, before Jedi unlocked the secrets of Force ghosts, and other um, stuff (midichloreans). Of course, the flip side of this would have to be some kind of backwards leap in technology; it always seemed absurd to me in the KOTOR and SWTOR, about the biggest difference is the number of Sith, and that in roughly a thousand years, the technological differences were largely constrained to how clunky droids and ships looked and the likelihood that someone would literally bring a vibroblade to a blaster fight. To be taken seriously I would think anything set in such an era would have to necessarily show a more technologically primitive galaxy, and that would probably be a tough sell for some (how many hyperspace lanes were discovered at that point anyway?). Needless to say, I'm on the fence about the prospect from an intellectual standpoint, but my gut is screaming "let's do this!" I suppose it all hinges on what Kathleen Kennedy (or possibly Bob Iger, if you believe the PR) feels the future (or past) off the franchise should be. Regardless, I'm just as excited to see what they do either way.